Cutting the perfectly diced onions or diagonally sliced carrots are easy with the help of Ceramic knives. Good ceramic knives always weigh lighter than our conventional stainless steel knives and that’s not the only reason why they are getting popular. Instead, their feature of resisting oxidization of the blade and limit the wear of metal from the surface of the blade is the main reason that makes a ceramic knife so popular. 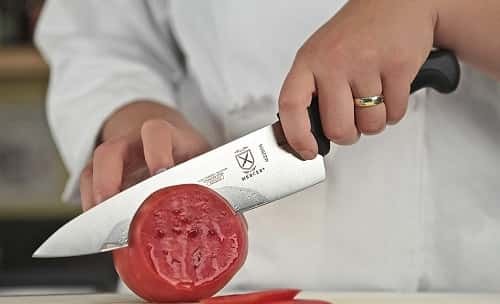 With their capabilities of enduring acids better than our conventional stainless steel knives, it becomes possible to cut meat, vegetables and fruits like a hot knife on a candle. Although just like our traditional knives, a ceramic knife can also get broken when you treat it rough. If you are looking for a ceramic knife to replace the traditional stainless steel knife from your kitchen, in this article, we are going to review the 10 best ceramic knives that you can buy to replace your old one. Also see the list for Best Ceramic Cookware 2019. With a set of three knives, varying from a large of 6-inch Chef’s knife, 5-inch micro-serrated knife of medium size, and the smallest 3-inch paring knife Kyocera Ultimate is the first knife in this list. The large 6-inch knife might seem very big but it perfectly functional for slicing vegetables, fruits, fish, and meat without bones. All the three knives have a strong blade of zirconium oxide. The knives are designed is well balanced and they are very lightweight. Remember the first knife, if you think it’s a big knife than let me tell you that Vos Ceramic Knife is bigger than it. 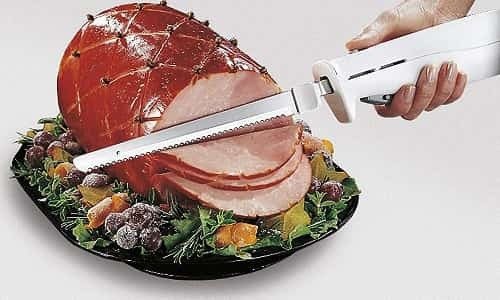 With an 8-inch long blade slicing of different food items become effortless. The comfortable green colour handle will make the knife feel balanced. 8-inch long blade has razor sharp edges that remain same for 10 times more than a stainless steel or carbon steel knife. The blade is odour proof and rust proof. This knife comes with a sheath to provide the safe storage. 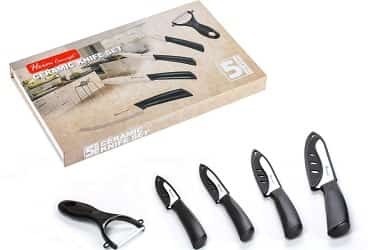 Offering a 5-piece set of Heim Concept ceramic knives, this one is a pretty sweet combo that comes with one ceramic peeler and four cutlery knives. With their black handle and white blades makes them super attractive. Ceramic peeler offers the very smooth way of pealing the skin off vegetables. Blade of cutlery knives varies from a 6-inch chef knife, 4-inch utility knife, 3-inch paring knife and a 5-inch knife for perfect slicing. All the blades are rustless and odourless as they are made of zirconium oxide. It comes with separate sheaths for each of the knife that provides better storage. To offer the perfect hold on the knife they are designed with a perfect ergonomic. This one is the second big knife on our list. I like it personally as just like its name suggests this knife is perfect for the slicing. 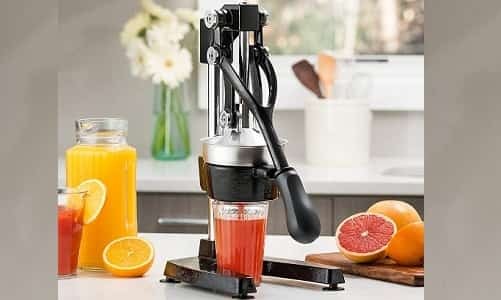 Not just for slicing the onions in small pieces but with the help of its long 8-inch zirconium blade cutting the large boneless meat into thin slices become effortless. The long ceramic blade is sharp and perfect for slicing. The blade is made of zirconium which is rust proof and odourless. For effortless slicing or cutting the handle is made to fit easily. The blade is hard enough to withstand the normal use but it can chip when used over a hard surface. Comes with their own separate sheaths these ceramic knives are very practical combo to use in a kitchen. Offering two blades sized an 8-inch long chef knife and a 4-inch long paring knife will certainly make your slicing and coting effortless and smooth. The blades of both the knives are perfect for dicing, slicing and chopping of all fruits without hardshell, vegetables and boneless meat. The blades won’t react with your food to give a discolour to the blade or change the taste of the food. Black blade with its black handle looks very attractive. Offering the effortless cutting, its blades are made of 4-grade fine quality zirconia. Ventura Online Shopping that you might also know as VOS provides their most colourful set of knives that I personally like because now I’ve a knife for each different use. The set contains a long long 6-inch chef knife, 4-inch medium size utility knife, a paring knife of perfect 3-inch size and a peeler. Made with hard Zincronica blades of all the knives and peeler these knives tend to stay 15 times more than a normal stainless steel knife. The ceramic used for the blades are antioxidant and it won’t change the taste of your food. The handle design is ergonomic and makes the kife feel lightweight. Each kife come with its own separate sheath for better storing. The package includes a user guide that will teach you the better caring of the knives. This one is the biggest and the best ceramic knives combo that is provided by the Chefcoo ™. 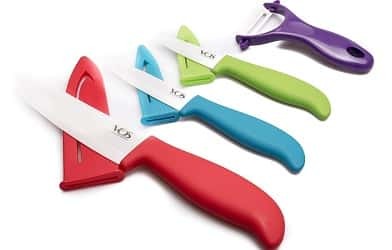 Chefcoo™ Kitchen Knife Set Plus contains a set of 7 beautiful knives along with a sharpener. 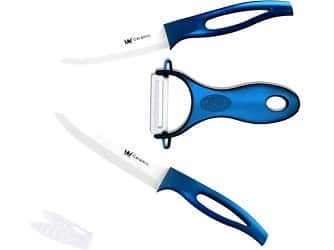 Personally, I don’t seem to buy it for myself but for the people who are in love with their ceramic knife and want to change all their old blades. 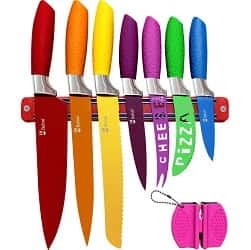 This must be a great option as all the knives are of different colour and come with a magnetic strip for the easy storing. Their package includes a Chief knife, Slicer, Pizza knife, Cheese cutter, Pairing knife, Utility, Serrated bread knife. Blades of all the knives are rust resistive and don’t react with the food. For comfortable handeling, the handles are made of ABS (acrylonitrile butadiene styrene). All the blades are relatively lighter than a steel blade. Offering a 4-inch pairing knife, 6-inch Chief’s knife and a 5-inch utility knife all made of a black handel and black blade, this is one of the best ceramic blades provided by Oliver & Kline. For a long-lasting sharpness that will make slicing-dicing smooth in the kitchen, these knives holds zirconia blade. Because the blades are rust proof it is quite easy to clean them. The handle is design in a way that fits perfectly both in the right or in the left hand of the person using them. The package comes with a nice storing box that will make sure it won’t get chipped by falling off from the kitchen top. The handle is made of ABS to reduce the weight of the knife in comparison to the stainless steel knife. 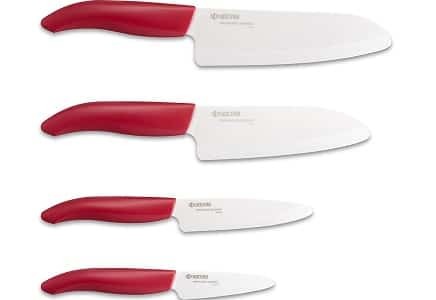 Known for providing the best knives, Kyocera Advanced Ceramic Revolution Series Knives are one of the best ceramic knives that I’ve personally used. Although the thing that makes them special is the lifetime warranty that is provided by the manufacturers. 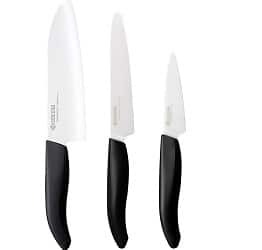 This set of 4 knives includes a 6-inch Chief knife (which is their longest knife in this set), 5.5-inch Santoku, 4.5-inch utility knife and a 3-inch paring knife. The blades are sharp and strong made with the Zirconium Dioxide. Zirconium Dioxide doesn’t rust or leave any kind of stain of your food that might change the taste. Knives are very lightweight and comfortable to use. Knives are perfect for cutting through any vegetable, fruits without hard-shell and boneless meat. Ceramic Knives are hugely popular kitchen knives not the least because they are extremely sharp, lightweight and affordable. Ceramic Knives are made of zirconium oxide which is second only to diamond in hardness. If you want to buy a ceramic knife for your kitchen, the following factors need to be considered by you. Chef’s knife – Ceramic chef’s knives are very easy to use and are suitable for quick operations. Ceramic chef’s knives are ideal for dicing, chopping, mincing and slicing boneless meats and vegetables. Utility Knife – Ceramic utility knives are suitable for making clean cuts. They are also ideal for chopping, slicing and peeling. The blade of a ceramic utility knife is smaller in size as compared to a chef’s knife. 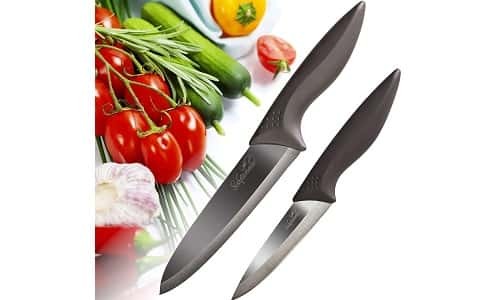 Paring Knife – Ceramic paring knife is suitable for deveining shrimps, peeling peppers and any other function which does not involve cutting into bones. Ceramic paring knife’s blade is smaller in size as compared to both utility and chef’s knife. Santoku Knife – Santoku ceramic knives are suitable for multiple uses. The blade length of Santoku ceramic knives can be 5-6 inches. They are highly suitable for cutting fish steaks, fillets and chicken breasts. Serrated Knife – A serrated ceramic knife is ideal for cutting soft fruits and vegetables and slicing breads and roasts. Type of Construction – The type of construction of the ceramic knife should also be considered while buying. Forged – Forged ceramic knives are created by molding individual units of metal under extremely high heat. The forged knives are balanced and durable and are able to hold sharp edge well. Since, ceramic knives are known for their highly sharp blades, the ability to hold sharp edge makes forged ceramic knife a good choice. Stamped – Stamped ceramic knife is constructed from a flattened sheet of metal. The blade of a stamped knife does not hold a sharp edge as well as a forged knife. The blade of a stamped knife is also lighter. Stamped ceramic knife is suitable to be used as a boning knife. Tang – The ceramic knife can have a full tang, partial tang or rat-tail tang. Tang means the metal portion of the knife which extends into the handle. Full tang is when the metal extends all the way through the entire handle. Partial tang is when the metal portion extends till the top of the handle. Rat-tail tang is when a thin tail of metal extends into the handle and is fully covered by the handle. The main advantage of full tang is that the knife is more stable and easy to control. Features of the blade – The blade of a good ceramic knife will have the following features. The cutting edge retains sharpness for long periods of time. The blade is resistant to rust. The blade does not react with fats, oils and salts. The blade is resistant to bacterial growth. The blade does not break easily with normal use. Brands – The top brands of ceramic knives in the market include Kyocera, Colwin, Cuisinart Elements, Vos and Kitchen Emperor to name a few. Ceramic knives are brittle in nature and can chip or break if not handled carefully. Ceramic knife should not be washed in a dishwasher because the blades can be damaged. The cleaning method is as follows. Clean the knife using warm water and soap. Soda can also be used to remove tough stains. Dry the knife with a paper towel or leave it on a dry cloth. Abrasive products must not be used to clean the knife to protect the non-stick property of the blade. 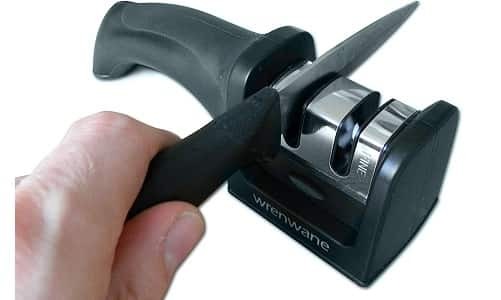 You need a diamond sharpener to sharpen your ceramic knife. The ceramic knife should not be used to cut bones or seeds. Ceramic knives are stronger than any steel blades and also weight less than our traditional knife. But it is needed to clarify that ceramic is very brittle and that’s why these ceramic knives ask for better caring. You cannot cut any frozen food, bones or fruits with hard shell as you might chip the blade while doing so. Other than that they are the best knives to use as they offer a number of benefits that you might already find out by now. If you are looking for the best ceramic knife to change your old stainless steel knife then the above mention list can certainly help you. Although the overall functionality of all the ceramic knives are the same going with a reputable name always a good option.